Highlight your listings’ photos and features with the Real Estate Keynote Template. Perfect for homes, flats, and commercial properties. Selling or leasing a property is hard work. In between hosting open houses and meeting with clients, there’s not much time left for designing a presentation to seal the deal, even though the presentation is important! This easy-to-use template is perfect for busy real estate professionals. Your clients love properties that are move-in ready. Now, here’s a template for you available for instant download. 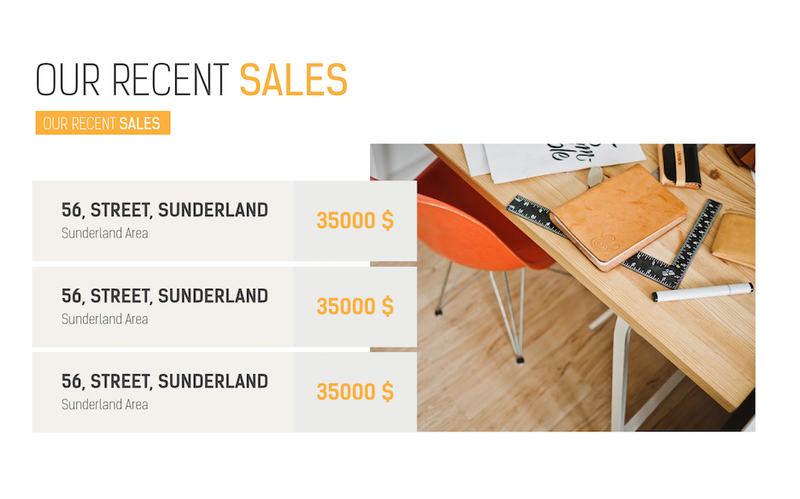 From 27 professional real estate themed icons to slides preformatted for listings and infographics for buyers to a variety of graphs/charts, the Real Estate Keynote Template features 37 fully customizable slides in a crisp color scheme. The templates allow your audience focus on your properties and all their amenities. 37 unique presentation slides designed by professionals that you can easily edit and fill out with your personal content. 27 icons are used in this template which you can flawlessly move, resize or change colors throughout your presentation slides. 1 color flavour is available in this template. What's included in Real Estate Keynote Template?